After a giant mishap with my first rental property. Your team member was refreshing to work with. Nice, quite, and relaxing. It had a welcoming feeling. It was very centralized while we spent time in disney, coca beach, tampa, clearwater, and wet n wild. Sherry and Darin are the easiest people to get along with. Whenever I had a concern or needed something. They were quick to get it taken care of. We developed a friendship that you wouldn't normally do with a property manager. If we come back to Florida in the future, we will definitely look for one of their properties. 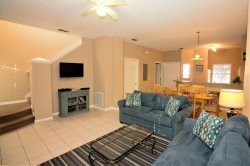 The unit at Lake Berkley is comfortable and well equipped. The Lake Berkley complex is well maintained. It seemed like there was someone there all the time doing some kind of up keep. Having a full time guard staff was also nice.